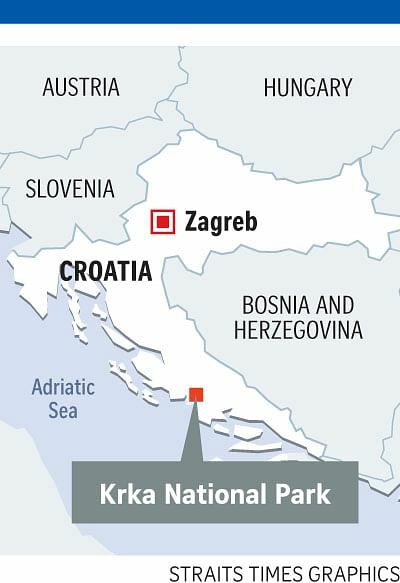 SINGAPORE - A 25-year-old undergraduate drowned in Croatia on Wednesday (May 25) while on a three-week European holiday to mark his graduation. National University of Singapore (NUS) undergraduate Andy Chow Kok Haw, a pharmacy student in his fourth year, was swimming at a waterfall at Krka National Park, a few kilometres north-east of the city of Sibenik, when the accident occured. He was due to graduate from NUS in July. It was previously reported by Chinese newspapers Shinmin Daily News and Lianhe Wanbao that he had been white water rafting when the accident occured, but his family has since disputed this. His father, Mr Victor Chow, 55, told The Straits Times that his son had been swimming at a deep segment of the waterfall, with his friends some distance away, before he drowned. "Nobody knew it was that deep. There were people swimming around as well. But when his friends noticed he was missing, it was already too late," said his father, who is an engineer. Mr Chow's friends alerted the authorities and divers were brought in to retrieve his body. It was his first time to Croatia, though he had previously backpacked in Europe before. He had also learnt swimming "on-and-off" before and during army, his father said. While his family has accepted that it was an accident, they are still coping with the loss. "Sometimes when you're swimming, anything can happen. You can't predict it," his father said. "It's a very hard period for us." Friends and schoolmates were shocked when they first learnt about the news on Tuesday (May 31). Many of them described him as friendly and approachable person, who had a ready smile for others. He also enjoyed playing sports. An adventure buff, Mr Chow was an active member of the NUS Rovers, an outdoor and adventure interest group. He was also previously the group's treasurer. The former Hwa Chong Institution graduate was a recipient of the MOH Holdings Health Science and Nursing Scholarship in 2012.